Product categories of Speckled Dice, we are specialized manufacturers from China, Custom Speckled Dice, Polyhedral Speckled Dice Set suppliers/factory, wholesale high-quality products of Engraved Speckled Dices R & D and manufacturing, we have the perfect after-sales service and technical support. Look forward to your cooperation! 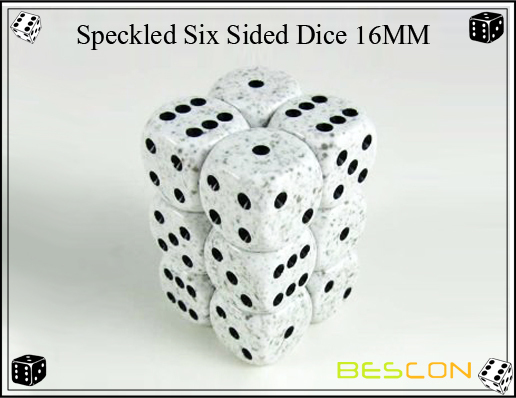 The speckled Dices are made of particularly dense material for a better feel when rolling. In Bescon you have full series of sizes and colors to meet your custom requirements. Whether you just need a few prototypes for testing, or if you're ready for your first production run, we can make the Dice you need, the way you want. Send us an email today!